About this Virtual Run: Did you know that 1 in 8 women will be diagnosed with breast cancer? And did you know that only half of these cases can be tied to traditional risk factors like genetic inheritance, diet and reproductive history? More and more scientific evidence is linking breast cancer to the chemicals in our everyday environment—chemicals in our food, our products, our air and our water. Breast Cancer awareness may be at an all-time high, but it’s time to shift the conversation from awareness to prevention. 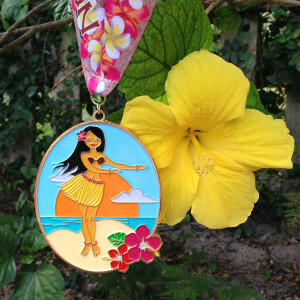 Support breast cancer prevention by participating the the Aloha Run virtual 5k/10k/Half Marathon this June. Run whenever you want, wherever you want, and with whomever you want. All registrants will receive a personalized race bib via email, and we’ll send you this cute 4″ medal after you upload your results (and a photo if you want to be included in our galleries) or when the virtual race period ends, whichever comes first. About the Charity: Founded in 1992, the Breast Cancer Fund works to prevent breast cancer by eliminating our exposure to toxic chemicals and radiation linked to the disease. The Breast Cancer Fund is the only national organization focused solely on breast cancer prevention. The organization is part of a broad environmental, reproductive public health and justice movement and their unique mission serves as a mighty voice for breast cancer prevention. A portion of the proceeds from this virtual run (at least $5 from each registration) will be donated to the Breast Cancer Fund. For more information about this organization or to make a direct contribution, please visit BreastCancerFund.org.